Transforming growth factor β1 (TGF-β1)-mediated epithelial mesenchymal transition (EMT) of alveolar epithelial cells (AEC) may contribute to lung fibrosis. Since PPARγ ligands have been shown to inhibit fibroblast activation by TGF-β1, we assessed the ability of the thiazolidinediones rosiglitazone (RGZ) and ciglitazone (CGZ) to regulate TGF-β1-mediated EMT of A549 cells, assessing changes in cell morphology, and expression of cell adhesion molecules E-cadherin (epithelial cell marker) and N-cadherin (mesenchymal cell marker), and collagen 1α1 (COL1A1), CTGF and MMP-2 mRNA. Serum-deprived A549 cells (human AEC cell line) were pre-incubated with RGZ and CGZ (1 - 30 μM) in the absence or presence of the PPARγ antagonist GW9662 (10 μM) before TGFβ-1 (0.075-7.5 ng/ml) treatment for up to 72 hrs. Changes in E-cadherin, N-cadherin and phosphorylated Smad2 and Smad3 levels were analysed by Western blot, and changes in mRNA levels including COL1A1 assessed by RT-PCR. TGFβ-1 (2.5 ng/ml)-induced reductions in E-cadherin expression were associated with a loss of epithelial morphology and cell-cell contact. Concomitant increases in N-cadherin, MMP-2, CTGF and COL1A1 were evident in predominantly elongated fibroblast-like cells. Neither RGZ nor CGZ prevented TGFβ1-induced changes in cell morphology, and PPARγ-dependent inhibitory effects of both ligands on changes in E-cadherin were only evident at submaximal TGF-β1 (0.25 ng/ml). 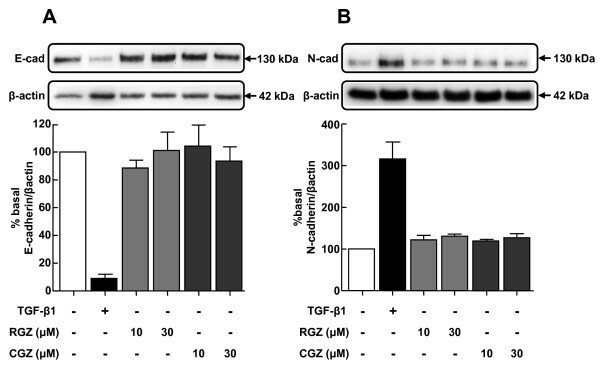 However, both RGZ and CGZ inhibited the marked elevation of N-cadherin and COL1A1 induced by TGF-β1 (2.5 ng/ml), with effects on COL1A1 prevented by GW9662. Phosphorylation of Smad2 and Smad3 by TGF-β1 was not inhibited by RGZ or CGZ. RGZ and CGZ inhibited profibrotic changes in TGF-β1-stimulated A549 cells independently of inhibition of Smad phosphorylation. Their inhibitory effects on changes in collagen I and E-cadherin, but not N-cadherin or CTGF, appeared to be PPARγ-dependent. Further studies are required to unravel additional mechanisms of inhibition of TGF-β1 signalling by thiazolidinediones and their implications for the contribution of EMT to lung fibrosis. In idiopathic pulmonary fibrosis (IPF), the most prominent change in lung architecture is the appearance of fibroblast foci in the lung interstitium. Diminution of the alveolar epithelial lining is accompanied by accumulation of fibroblast-like mesenchymal cells that secrete excessive extracellular matrix proteins such as fibrillar collagen I and III . Current treatment for IPF includes glucocorticoids, which show poor efficacy and do not prevent disease progression or reduce the high mortality rates within 5 years of diagnosis [1–3]. It is critical therefore to identify novel therapeutic agents that target foci development to address this area of pressing medical need. The exact origin of increased fibroblast-like cells within foci is not known but these cells possess myofibroblast-like properties evidenced by expression of α-smooth muscle actin (αSMA) [4, 5]. In IPF, myofibroblasts are regarded as the main perpetrators of fibrosis as they appear to be the major source of ECM proteins such as fibrillar collagen I [6, 7]. Initially, it was thought that myofibroblasts develop from the differentiation of resident parenchymal fibroblasts in response to profibrotic cytokines, such as transforming growth factor-β1 (TGF-β1) [8–11]. Recently however, immunostaining of lung biopsies from IPF patients has revealed fibroblast-like cells expressing the surfactant protein C (SP-C) normally synthesised and secreted by type II alveolar epithelial cells (AECII) . This suggests that in addition to regenerating damaged alveolar epithelial lining , AECII may undergo epithelial-mesenchymal transition (EMT) to contribute to foci development in the disease context. TGF-β1 has been identified as a potent stimulus for EMT, whereby epithelial cells acquire hyperplasticity and develop a mesenchymal-cell phenotype [5, 13–15]. TGF-β1 treatment has been shown to alter the cell morphology of the human AECII derived A549 cell line from cobblestone-shaped to a fibroblastoid appearance [13, 15]. Phenotypic markers associated with EMT included diminished expression of E-cadherin, a cell anchoring protein expressed specifically by epithelial cells, and elevated expression of N-cadherin, normally present at relatively higher levels in fibroblasts [8, 10]. These alterations were accompanied by increased secretion of the gelatinase matrix metalloproteinase-2 (MMP-2) [13, 14], increased cell motility [15, 16] and de novo synthesis of fibrillar collagen I and III . Given the established actions of TGF-β1 on fibroblast differentiation, EMT and collagen synthesis, studies have investigated potential therapeutic benefits of targeting profibrotic effects of TGF-β1. Peroxisome proliferator-activated receptor γ (PPARγ) is a nuclear hormone receptor activated by the thiazolidinedione class of anti-diabetic drugs that may have a role in the regulation of both inflammation and fibrosis in the lung [17, 18]. In cultured lung fibroblasts from subjects with and without IPF, the PPARγ ligands rosiglitazone (RGZ), troglitazone (TGZ) and ciglitazone (CGZ) prevented TGF-β1-mediated increases in αSMA expression and fibrillar collagen synthesis [8, 9]. Similar findings have been observed in skin fibroblasts , with PPARγ ligands inhibiting TGF-β1 signalling via the Smad pathway. Additional in vivo studies revealed that treatment with TGZ and CGZ protected against bleomycin-induced lung fibrosis in mice , a model in which glucocorticoids are ineffective . To date, the ability of PPARγ ligands to antagonize TGF-β1-mediated changes associated with EMT in human AECII has not been explored. In the current study, we use a well-validated model of EMT in the A549 human alveolar cell line in which a suite of morphological, phenotypic and functional markers and outcomes have been well characterised . Our results demonstrate that RGZ and CGZ inhibit several TGF-β1-induced changes in markers of EMT and lung fibrosis, including cadherin proteins and collagen gene expression, to provide further support for the antifibrotic potential of the thiazolidinedione class of compounds. Recombinant human TGF-β1 was purchased from R&D systems (Minneapolis, MN). RGZ, CGZ and GW9662 and rabbit polyclonal antibody against human PPARγ were from Cayman Chemical Corporation (Ann Arbor, MI) and sheep polyclonal Texas-red conjugated anti-rabbit antibody was from Abcam (Cambridge, UK). Mouse monoclonal antibodies against human E-cadherin and N-cadherin were from BD Transduction Laboratory (Oxford, UK), against human β-actin from Abcam (Cambridge, UK) and against human αSMA from Sigma Aldrich (St. Louis, MO). Rabbit monoclonal antibodies against human Smad2 and Smad3, and phosphorylated Smad2 and Smad3 were from Cell Signaling Technology (Beverly, MA). Sheep HRP-conjugated polyclonal anti-mouse and anti-rabbit antibodies were from Chemicon International (Temecula, CA). Quantitect primers for the human genes COL1A1, COL3A1 and 18s rRNA were from Qiagen (Hilden, Germany) and the primer sequences for αSMA (ACTA2) and MMP-2 were previously reported in  and were synthesised by Geneworks (Adelaide, Australia). Phosphate buffered saline (PBS) was from Oxoid (Basingstoke, UK), with all other chemicals and reagents from Sigma Aldrich. Human type II alveolar epithelial cell line A549 (ATCC, Manassas, VA) was maintained in high glucose-DMEM (Invitrogen, Carlsbad, CA) containing 10% (v/v) FBS, 15 mM HEPES, 20 mM sodium bicarbonate, and 2 mM L-glutamine at 37°C in a humidified 5% CO2 atmosphere. Cells were seeded at a density of 5 × 104 cells per well onto 6-well plates, or at 2 × 103 cells per well onto 8-well Lab-Tek Chamber slides which were pre-coated with 0.1 mg/ml (w/v) poly-L-lysine solution. After overnight attachment, cells were maintained in serum-free DMEM containing 0.25% (w/v) bovine serum albumin (BSA) for 24 hr. PPARγ ligands were prepared as 30 mM stocks in dimethylsulfoxide (DMSO), with 0.1% DMSO used as vehicle control for treatment of cells. Cells were preincubated with PPARγ agonists RGZ or CGZ (1-30 μM) in the absence or presence of the PPARγ antagonist GW9662 (10 μM)  for 60 min prior to stimulation with TGF-β1 (0.75-7.5 ng/ml) for 2-24 hr for immunocytochemical studies, 24 hr for mRNA analysis or up to 72 hr for protein analysis. These drugs did not affect A549 cell viability as measured by Trypan blue staining. 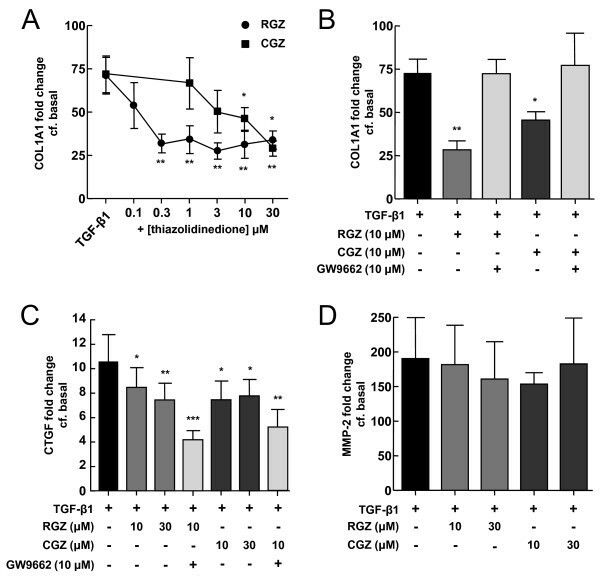 The concentration of GW9662 used has been shown to have no effect on basal PPRE promoter activity but to suppress RGZ-induced activation of the PPRE reporter [22, 23] and the antiproliferative effects of RGZ in human cultured airway smooth muscle . Cells on chamber slides were washed with PBS, fixed in ice-cold methanol for 10 min, and then blocked with 2% BSA in PBS for 1 hr at room temperature. Cells were then incubated with primary PPARγ antibody (1:100) for 2 hr at room temperature. After washing, antibody binding was detected by incubating with sheep polyclonal Texas-red conjugated anti-rabbit antibody (1:100) for 1 hr. Cell nuclei were visualised by staining with 1 μg/ml (w/v) Hoescht-33258 dye for 20 min at room temperature. Images were collected with a Carl Zeiss Axioscope microscope system at 20× magnification. A549 cells were washed with PBS, then treated with whole cell lysis buffer (100 mM NaCl, 0.5% w/v 10 mM Tris-HCl (pH = 7.5), 0.5% w/v sodium deoxycholate, 2 mM sodium EDTA and 1% v/v Triton-X) supplemented with 1% v/v protease inhibitor cocktail and phosphatase inhibitor cocktail 2. Cells were lysed for 20 min on ice before centrifugation and collection of supernatants. To separate cytosolic and nuclear proteins, cells were treated for 10 min on ice with cytosolic lysis buffer (10 mM HEPES, 10 mM KCl, 10 mM EDTA, 1 mM DTT) supplemented with 1% v/v protease inhibitor cocktail and 0.4% v/v IGEPAL. After centrifugation, the supernatant containing the cytosolic fraction was collected and the remaining pellet treated with lysis buffer for cell nuclei (10 mM HEPES, 400 mM NaCl, 1 mM EDTA, 10% v/v glycerol, pH 7.9) supplemented with 1% v/v protease inhibitor cocktail and 1 mM dithiothreitol. Samples were homogenised by vortexing and then incubated at 200 rpm on ice for 2 h on a rocking platform. All protein supernatant samples were collected following centrifugation at 13,000 g (5 min, 4°C) and stored at -20°C. Total protein concentration was measured via a spectrophotometer (Thermoplus, Finland) using the bicinchoninic acid (BCA) protein assay kit (Bio-Rad, Hercules, CA) with BSA utilised as the protein standard. 20 μg of total protein from each sample was separated on 10% polyacrylamide gels (Bio-Rad). After electrophoresis, separated proteins were transferred onto Hybond Nitrocellulose membranes (Amersham, Buckinghamshire, UK). Membranes were then blocked for 1 hr at room temperature with 5% w/v skimmed milk solution or 2% w/v BSA in TBST. Membranes were then probed with primary antibodies (1:10,000 for β-actin, 1:1000 for other antibodies) for 18 hr at 4°C. After washing with TBST, membranes were probed with either sheep anti-mouse or anti-rabbit HRP-conjugated secondary antibodies for 1 hr at room temperature. Immunoblots were visualised by enhanced chemiluminescence (GE Healthcare, Chalfont St Giles, UK) and band densities quantified using ImageQuant TL software after image acquisition with an ImageQuant 350 (GE Healthcare). Results were expressed relative to β-actin band density used as a loading control. Total RNA was extracted using the RNeasy Kit (Qiagen). For complementary DNA (cDNA) synthesis 1 μg of total RNA was reverse transcribed using Superscript III (Invitrogen). cDNA equivalent to 10 ng of total RNA was used for all PCR reactions in the presence of 100 nM of forward and reverse primers (refer to Materials section). All PCR reactions were performed using Platinum SYBR Green qPCR SuperMix-UDG (Invitrogen) in an ABI Prism 7900 HT sequence detection system (Applied Biosystems, Foster City, CA). For normalization of all RT-PCR data, 18s rRNA expression was used as a reference gene. Relative transcript abundance of COL1A1, MMP-2 and CTGF were expressed in ΔCt values (ΔCt = Ctreference-Cttarget). Relative fold changes in transcript levels compared to basal levels were calculated as 2ΔΔCt (ΔΔCt = ΔCttreatment-ΔCtbasal). Data were expressed as mean response ± S.E.M. for n repeated experiments and analysed using Graph Pad Prism version 5.0 software. The effects of TGF-β1 on cadherin expression were analysed by one-way ANOVA on raw densitometric data normalised for β-actin as loading control. The effects of PPARγ ligands in the presence and absence of antagonist on TGF-β1-mediated changes of EMT markers were tested by one-way repeated measures ANOVA followed by Bonferroni post hoc test for multiple comparisons with data normalised to control levels in the absence of TGF-β1. Effects were considered to be statistically significant when P < 0.05. Immunocytochemical staining for PPARγ was performed in serum-deprived A549 cells. Under basal conditions, PPARγ was detected in both cytoplasm and nuclei, with higher levels of expression evident in the cytosol (Figure 1A). However, in cells treated with the PPARγ ligand RGZ, both perinuclear and nuclear staining for PPARγ was increased within 2 hr with maximal effects observed at 24 hr (Figure 1A). Changes in receptor localization in the presence of RGZ were prevented by the PPARγ antagonist GW9662 (Figure 1A). RGZ-induced nuclear translocation was confirmed by Western blotting showing increased levels of PPARγ in nuclear extracts at 2, 4 and 24 hrs (Figure 1B). Cellular PPARγ protein levels were not regulated by treatment with TGF-β1 (Figure 1C). PPARγ expression and localization in A549 cells. (A) Immunocytochemistry for PPARγ in A549 cells. Cells were grown to confluence on chamber slides, serum deprived for 24 hr and then treated with either vehicle (0.1% DMSO, left) for basal, 10 μM GW9662, 10 μM RGZ or 10 μM RGZ + 10 μM GW9662 for 24 hr. PPARγ localization in the cells was detected by immunocytochemistry (left column) and the nuclei visualised by Hoechst staining (right column). (B) Western blot for PPARγ expression in the cytosol and nuclei of serum-deprived A549 cells in the absence and presence of RGZ (10 μM) for 2 to 24 hr. Basal levels were measured at 2 hr after vehicle (0.1% DMSO) treatment. (C) Western blot for PPARγ expression in A549 cells in the absence and presence of TGF-β1 (72 hrs). All images and blots are representative of 3 separate experiments. In the ICC images bar = 100 μm. Having verified PPARγ receptor expression and the ability of RGZ to cause receptor translocation in these cells, we next investigated whether thiazolidinediones could regulate TGF-β1-mediated changes in markers of EMT. Under basal conditions, A549 cells expressed relatively higher levels of E-cadherin than N-cadherin, consistent with their epithelial phenotype. Treatment with RGZ and CGZ at concentrations up to 30 μM did not affect basal levels of either cadherin (Figure 2A, B). Regulation of basal E-cadherin and N-cadherin expression by PPARγ ligands. (A) Effect of TGF-β1 or PPARγ ligands on expression of epithelial marker E-cad (n = 4). (B) Effect of TGF-β1 or PPARγ ligands on expression of mesenchymal marker N-cad (n = 4). Cell lysates were prepared from A549 cells pre-incubated with vehicle, TGF-β1 (2.5 ng/ml), or RGZ or CGZ at the concentrations indicated for 72 hr. Densitometric analysis values for band intensities from each Western blot were normalised to β-actin and expressed as a percentage of basal levels. Each point represents mean ± s.e.m. TGF-β1 treatment of A549 cells for 72 hr reduced basal expression of E-cadherin in a concentration-dependent manner (Figure 3A). The 60% reduction in E-cadherin levels in the presence of 0.25 ng/ml TGF-β1 was partially inhibited by both RGZ and CGZ at concentrations up to 10 μM but this effect was not maintained at 30 μM (Figure 3B, D). The effectiveness of RGZ was also reduced when cells were stimulated with 0.75 or 2.5 ng/ml TGF-β1 (Figure 3B), and CGZ was unable to prevent the maximal decrease in E-cadherin at these TGF-β1 concentrations (data not shown). The PPARγ antagonist GW9662 alone did not affect the reduction of E-cadherin expression induced by 0.25 ng/ml TGF-β1 but prevented the partial inhibitory effects of both PPARγ ligands (Figure 3C, D, E). Regulation of TGF-β1-induced E-cadherin expression by PPARγ ligands. (A) Effect of TGF-β1 on expression of epithelial marker E-cad (n = 4). (B) Effect of RGZ on regulation of E-cad expression by TGF-β1 (n = 6). (C, D) Effect of the PPARγ antagonist GW9662 (10 μM) on regulation of TGF-β1-mediated E-cad expression by RGZ (n = 4) and CGZ (n = 4). (E) Western blot showing the effect of GW9662 on RGZ-mediated inhibition of TGF-β1 effect on E-cad expression (representative of n = 4 experiments). Cell lysates were prepared from A549 cells pre-incubated with vehicle, RGZ or CGZ with or without GW9662 for 1 hr, stimulated with TGF-β1 at the concentrations indicated for 72 hr. Densitometric analysis values for band intensities from each Western blot were normalised to β-actin and expressed as a percentage of basal levels. Each point represents mean ± s.e.m. * P < 0.05, compared with basal (A) TGF-β1 (B-D). Low basal expression of N-cadherin in A549 cells was increased approximately 3-fold by TGF-β1 (Figure 4A). In contrast, basal expression of αSMA was not affected by TGF-β1 at concentrations up to 7.5 ng/ml (data not shown). 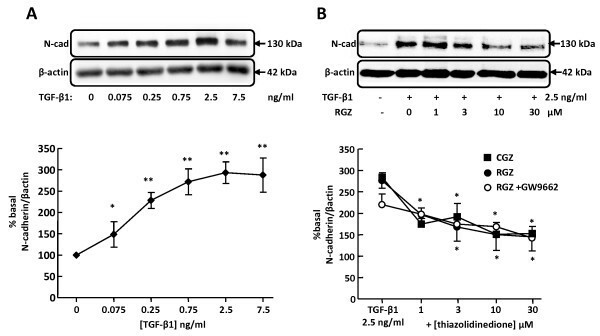 Both RGZ and CGZ partially inhibited the maximum increase in N-cadherin expression in response to 2.5 ng/ml TGF-β1 (Figure 4B). The inhibitory effects of RGZ and CGZ were maintained in the presence of GW9662 (RGZ Figure 4B, CGZ data not shown). Regulation of TGF-β1-induced N-cadherin expression by PPARγ ligands. (A) Effect of TGF-β1 on expression of mesenchymal marker N-cad (n = 4). 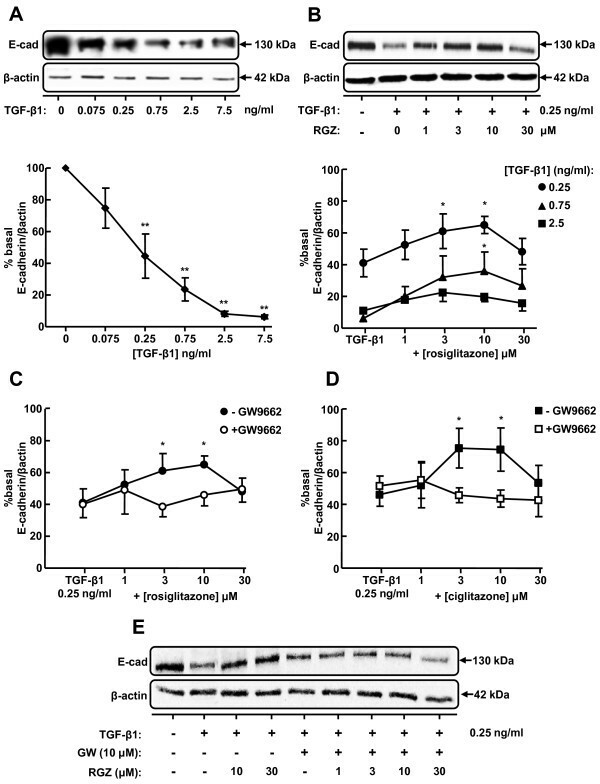 (B) Effect of PPARγ ligands on regulation of N-cad expression by 2.5 ng/ml TGF-β1 (RGZ, n = 6; RGZ + GW9662, n = 6; CGZ, n = 6). Cell lysates were prepared from A549 cells pre-incubated with vehicle, RGZ or CGZ with or without GW9662 for 1 hr, stimulated with TGF-β1 at the concentrations indicated for 72 hr. Densitometric analysis values for band intensities from each Western blot were normalised to β-actin and expressed as a percentage of basal levels. Each point represents mean ± S.E.M. * P < 0.05, ** P < 0.01 compared compared with basal (A) or TGF-β1 (B). Treatment of A549 cells with 2.5 ng/ml TGF-β1 for 24 hr caused 71 ± 11 fold (n = 5, P < 0.01) and 190 ± 59 fold (n = 4, P < 0.01) increases in COL1A1 and MMP-2 mRNA levels respectively (Figure 5A, D). The increase in CTGF mRNA level was more modest (11 ± 2 fold, n = 7, P < 0.05, Figure 5C). Basal levels of collagen III or αSMA mRNA were not significantly upregulated by TGF-β1 (data not shown). Regulation of TGF-β1-induced COL1A1, CTGF and MMP-2 mRNA levels by PPARγ ligands. (A) Effect of PPARγ agonists on regulation of COL1A1 mRNA levels by TGF-β1 (n = 5). (B) Effect of the PPARγ antagonist GW9662 (10 μM) on regulation of TGF-β1-mediated COL1A1 mRNA by RGZ (n = 6) and CGZ (n = 4). (C) and (D) Effect of PPARγ ligands on regulation of CTGF and MMP-2 mRNA levels by TGF-β1 (n = 4,7). Total RNA was collected from A549 cells pre-incubated with vehicle, RGZ or CGZ with or without GW9662 for 1 hr and then stimulated with 2.5 ng/ml TGF-β1 for 24 hr. Results were normalised to 18s rRNA levels and expressed as fold change from basal levels. Each point represents mean ± S.E.M. * P < 0.05, ** P < 0.01, *** P < 0.001 compared with TGF-β1. The TGF-β1-induced increase in COL1A1 mRNA was attenuated by both RGZ and CGZ to a similar extent, although RGZ was markedly more potent (Figure 5A). Both RGZ and CGZ partially inhibited the increase in CTGF (Figure 5C). The effects of both PPARγ ligands on COL1A1 but not CTGF mRNA were abolished in the presence of GW9662 (Figure 5B, C). In contrast, the increase in MMP-2 mRNA following TGF-β1 treatment was not inhibited by RGZ or CGZ (Figure 5D, n = 7, P < 0.05). In the presence of 2.5 ng/ml TGF-β1, the morphology of A549 cells changed from the classical cobblestone appearance of alveolar epithelial cells to predominantly elongated fibroblast-like cells (Figure 6). These changes were not evident following treatment with 0.25 ng/ml TGF-β1. 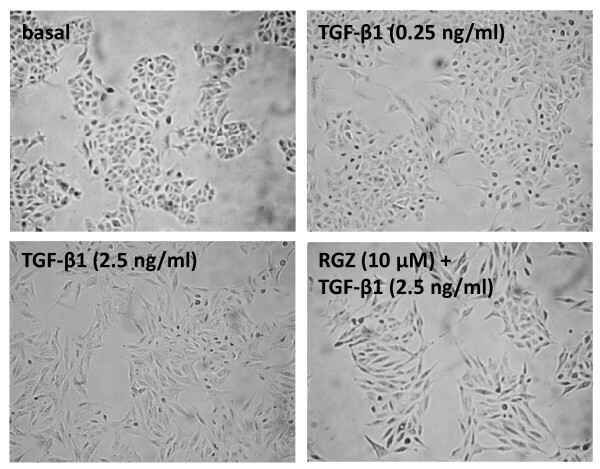 Pre-treatment with RGZ or CGZ did not affect cell morphology in the absence or presence of TGF-β1 (Figure 6, CGZ not shown). Regulation of TGF-β1-induced changes in cell morphology by rosiglitazone. A549 cells were incubated with vehicle (0.1% DMSO), TGF-β1 (0.25 ng/ml), TGF-β1 (2.5 ng/ml) or TGF-β1 (2.5 ng/ml) + RGZ (10 μM) for 72 hr and photographed at 100× magnification. The images are representative of 4 separate experiments. Under basal conditions in the absence of TGF-β1, A549 cells expressed Smad2 and Smad3 proteins, and treatment with RGZ or CGZ had no effect (Figure 7). The phosphorylated forms of these proteins could be detected as early as 15 min after TGF-β1 stimulation (data not shown), with maximum phosphorylation after 1 hr. Pretreatment with RGZ or CGZ did not prevent the increase in levels of phosphorylated Smad proteins in response to TGF-β1 (Figure 7). Regulation of TGF-β1-induced phosphorylation of Smad2 and Smad3 by PPARγ ligands. Cell lysates were prepared from A549 cells pre-treated with vehicle, RGZ (10 μM) or CGZ (10 μM) for 1 hr and then treated with TGF-β1 at the indicated concentrations for 1 hr. The Western blot is representative of 3 separate experiments. In this study, we show that the PPARγ ligands RGZ and CGZ inhibit TGF-β1-induced changes in E-cadherin, N-cadherin, collagen I and CTGF expression in A549 cells in the absence of regulatory effects on cell morphology. RGZ was consistently more effective than CGZ in inhibiting PPARγ dependent changes in markers of EMT, in agreement with their relative binding affinities for PPARγ. However, since inhibitory effects occurred via both PPARγ-dependent and PPARγ-independent pathways and were not associated with inhibition of Smad phosphorylation, it is proposed that multiple mechanisms underlie potential antifibrotic actions of PPARγ ligands in these cells. Recent studies provide evidence that TGF-β1-induced EMT of AECII may contribute to the de novo appearance of myofibroblasts in fibrotic lungs [4, 5, 25–27]. Although these findings are not universal , it has been shown that induction of lung fibrosis in mice by overexpression of active TGF-β1 or bleomycin treatment resulted in the accumulation of mesenchymal cells with AECII origins adjacent to fibrotic lesions [4, 25]. Additionally, fibroblast-like cells in lung biopsies from IPF patients expressed the AECII surfactant protein SP-C .
To explore potential regulation of EMT in AECII by PPARγ ligands, we have used A549 cells as a model of human AECII. A549 cells possess many features of normal AECII cells  and have been used in numerous studies examining EMT [13–16, 30–32]. We characterised EMT in A549 cells by detecting changes in cell morphology, E-cadherin and N-cadherin levels, and collagen I, CTGF and MMP-2 gene expression. These markers facilitate identification of cells along the spectrum of transition from epithelial to mesenchymal phenotype. Critically, A549 cells express PPARγ, the receptor target of the thiazolidinedione class of drugs which includes RGZ and CGZ. 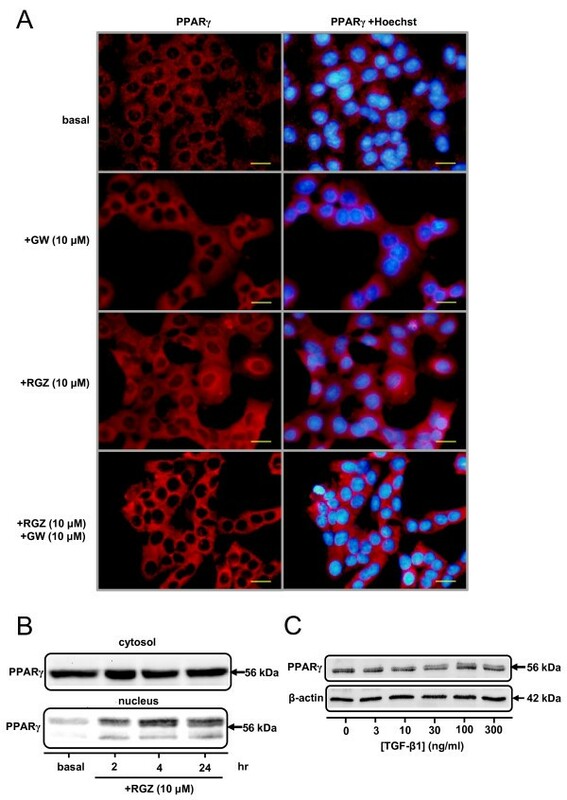 In the current study, nuclear translocation of PPARγ by RGZ provided evidence that PPARγ activation could potentially regulate cellular functions of A549 cells, including EMT. This translocation was prevented by the PPARγ antagonist GW9662, supporting the use of this pharmacological tool to explore the PPARγ-dependence of the actions of RGZ and CGZ. In this study, treatment of cells with RGZ or CGZ in the absence of TGF-β1 failed to elicit any detectable changes in expression of cell adhesion molecules or morphology. Direct regulation of EMT by PPARγ ligands may vary depending on cellular origin, since PPARγ activation by RGZ has previously been shown to promote EMT of gastrointestinal epithelial cells, characterised by increased cell scattering and altered cell morphology . Consistent with previous findings in A549 cells, TGF-β1 treatment caused cells to lose their polygonal appearance and cell-cell contacts leading to the acquisition of elongated, spindle-shaped morphology consistent with fibroblasts . TGF-β1 also altered the expression of cell adhesion molecules consistent with EMT as reported previously [13, 30]. Significant reductions in E-cadherin, a protein expressed only by epithelial cells and diminished during EMT , were evident even in the absence of obvious morphological changes, suggesting that a loss of >60% E-cadherin is required before cell morphology is altered. Under these conditions, the partial inhibition of the reduction in E-cadherin by both RGZ and CGZ was PPARγ dependent, since it was abolished in the presence of the selective PPARγ antagonist GW9662. The modest inhibitory effect was not maintained at the highest concentrations of PPARγ ligands tested, but the mechanism for this loss of activity was not explored. The maximum effect of TGF-β1 elicited was a 90% loss of E-cadherin expression, suggesting that cells that have undergone EMT may still retain epithelial phenotypic markers. In vivo studies have previously reported retention of the AECII specific SP-C and pro SP-B proteins in mesenchymal cells derived from EMT [4, 5]. Thiazolidinedione treatment was unable to prevent this maximal reduction in E-cadherin expression accompanied by loss of epithelial morphology. Low expression of N-cadherin and αSMA were detected under basal conditions in A549 cells, despite the classification of these markers as mesenchymal specific [34–36]. Similar findings have been described in both A549 cells [13, 31], and in RLE-6TN cells , a rat AECII cell line reported to undergo EMT upon TGF-β1 treatment [5, 37, 38]. In RLE-6TN cells, basal expression of αSMA was attributed to constitutive activation of TGF-β1 type I receptor kinase (TGFβRI) , and may also contribute to basal N-cadherin and αSMA expression in A549 cells. Following TGF-β1 treatment, concomitant increases in N-cadherin accompanied reductions in E-cadherin expression in A549 cells. Although both proteins mediate cell to cell attachment, cell adhesion by E-cadherin is four times stronger than adhesion by N-cadherin . In squamous carcinoma cells, N-cadherin has also been shown to promote scattering and increased motility . It is likely then that the relative expression levels of these molecules contributed to the loss of cell-cell contact in A549 cells evident at higher concentrations of TGF-β1. The maximum TGFβ1-induced increase in N-cadherin expression was approximately 3-fold higher than basal levels. In contrast to their limited effects on the reduction in E-cadherin, both RGZ and CGZ were able to decrease the elevation in N-cadherin levels to a similar extent following treatment with 2.5 ng/ml TGF-β1. In addition, the inhibitory effects of PPARγ ligands on the increased N-cadherin expression were not attenuated by GW9662, suggesting a separate PPARγ-independent pathway. In addition to altered cadherin expression, A549 cells stimulated with TGF-β1 displayed other features similar to lung fibroblasts. Under basal conditions, A549 cells do not synthesize fibrillar collagen I or CTGF, and only express low levels of MMP-2 [13, 14, 41]. MMP-2 activity is thought to be an important contributor to EMT by facilitating basement membrane breakdown and migration of cells into the interstitium [42–44]. CTGF expression is induced by TGF-β1 and has profibrotic properties including stimulation of fibrillar collagen production and myofibroblast accumulation [41, 45]. As confirmed in this study, stimulation with TGF-β1 caused marked increases in mRNA for COL1A1, which encodes the α1 chain of mature collagen I fibers, as well as MMP-2 and CTGF. However, in contrast to a previous report , significant increases in COL3A1 mRNA were not detected. Both RGZ and CGZ significantly reduced the induction of COL1A1 and CTGF, but not MMP-2 mRNA levels by TGF-β1 in A549 cells. The higher potency of RGZ relative to CGZ to reduce COL1A1 was consistent with their relative binding affinities for PPARγ [46, 47], with PPARγ dependence further supported by the abolition of their inhibitory effects in the presence of GW9662. These findings are in agreement with studies in skin and lung fibroblasts where PPARγ ligands inhibited fibrillar collagen I synthesis [8, 9, 19]. In this study on A549 cells, the PPARγ-dependent antifibrotic effects of sub-micromolar concentrations of RGZ are of particular interest in the context of excessive collagen production by myofibroblasts in lung fibrosis. Overall, the current findings suggest that the inability of PPARγ ligands to prevent changes in A549 morphology and cell-cell contact at high TGF-β1 concentrations may be due to their limited capacity to exert inhibitory effects on TGF-β1-induced changes in E-cadherin and MMP-2 expression. However, marked inhibitory effects of RGZ on collagen and N-cadherin were maintained with maximal TGF-β1 stimulation and appeared to be via PPARγ-dependent and PPARγ-independent pathways respectively. Although PPARγ ligands may not prevent the acquisition of a mesenchymal phenotype, their impact on collagen synthesis may provide protection from the progression of fibrosis. Ideally, these findings should be extrapolated to primary human alveolar epithelial cells to enable further assessment of RGZ and related compounds in regulation of TGF-β1-induced pro-fibrotic functions. In addition to examination of PPARγ dependence, further studies were conducted to assess potential mechanisms whereby PPARγ ligands regulate TGF-β1-mediated changes associated with EMT. TGF-β1-mediated EMT in A549 cells is thought to be dependent on Smad2 and Smad3 phosphorylation [13, 31, 37, 38], since inhibition of Smad2 expression using siRNA prevented the loss of E-cadherin expression induced by TGF-β1 treatment . Similar results were evident following induction of the intracellular Smad2 and Smad3 antagonist Smad7 by hepatocyte growth factor in RLE-6TN cells . Several studies have shown that PPARγ activation can directly interfere with Smad signaling by either inhibiting Smad2/3 phosphorylation or Smad2/3 nuclear translocation [48, 49]. In this study, Smad phosphorylation in response to TGF-β1 was not reduced by RGZ or CGZ. Our findings may be explained by an alternative mechanism identified in fibroblasts, whereby Smad-dependent transcriptional responses were blocked by PPARγ without preventing Smad 2/3 activation . In this recent study, PPARγ inhibited the interaction between activated Smad2/3 and the transcriptional coactivator and histone acetyltransferase p300 induced by TGF-β1, and the accumulation of p300 on consensus Smad-binding DNA sequences and histone H4 hyperacetylation at the COL1A2 locus . Alternative mechanisms for the potent PPARγ-dependent inhibitory effects observed for collagen I include direct regulation of promoter activity by PPARγ ligand-receptor complexes. This possibility is supported by evidence that constitutive COL1A2 promoter activation in PPARγ knockout mouse embryonic fibroblasts could be normalised by recovery of PPARγ expression . In addition PPARγ activation is known to attenuate the signaling of other transcription factors such as Sp1 which is essential for COL1A2 gene transcription in human glomerular mesangial cells [51, 52], and up regulation of EGR-1 an early-immediate response transcription factor that is also responsible for TGF-β1-mediated fibrosis . Further studies are required to address the alternative mechanisms of inhibition of Smad signaling which could contribute to PPARγ-dependent regulation of TGF-β1 responses in A549 cells. In addition, PPARγ-independent effects of thiazolidinediones described in other cell types [54, 55] also remain to be explored in the context of the effects of RGZ and CGZ on changes in expression of phenotypic markers of EMT. In the current study, treatment with PPARγ ligands markedly reduced TGF-β1-induced increases in collagen I, CTGF and N-cadherin in A549 cells, with inhibitory effects on changes in E-cadherin also evident. RGZ was generally more effective than CGZ, but neither PPARγ ligand inhibited the morphological changes of these cells to become fibroblast-like in appearance. The variable effects of the PPARγ antagonist GW9662 on the inhibitory effects of RGZ and CGZ implicate both PPARγ-dependent and PPARγ-independent pathways in the regulation of TGF-β1-mediated responses. Given the lack of effective therapy to inhibit the progression of lung fibrosis and the proposed contribution of EMT to this process, these findings support further exploration of the antifibrotic properties and mechanisms of action of PPARγ ligands in human alveolar epithelial cells to clarify their potential therapeutic benefit. This work was supported by the National Health and Medical Research Council [Grant 509239]; Asthma Foundation of Victoria; Contributing to Australian Scholarship and Science (CASS) Foundation; and ANZ Medical Research and Technology in Victoria Fund. A549 cells were kindly supplied by Professor Alastair Stewart (Dept. of Pharmacology, University of Melbourne). XT, CH and JB conceived the study. XT and HD conducted the experiments and the data was then analysed and interpreted by XT and JB. XT prepared the draft manuscript, which was edited by HD, CH and JB. All authors read and approved the final manuscript.